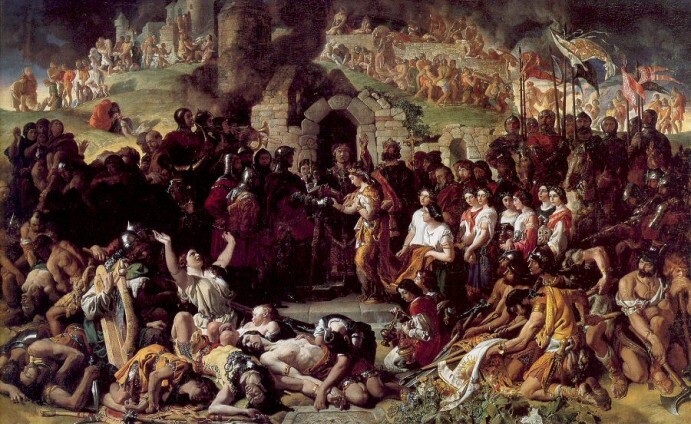 Far from settling into peaceful coexistence following the defeat of the Vikings in the early 11th century, Irish Chieftains immediately engaged in a series of bloody battles in an effort to assert their authority and gain control of territory. For 150 years there was continuous wars and unrest, with various chieftains coming to the fore, then receding again as they were defeated by neighboring kingdoms. 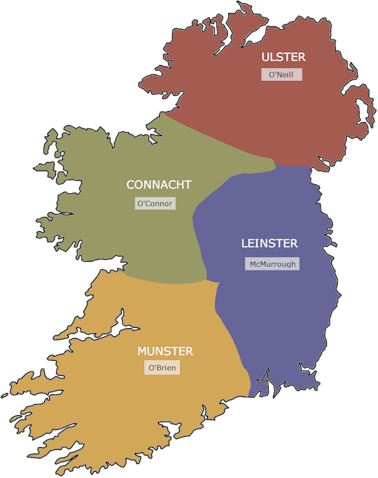 Eventually, by about 1150, four powerful clans had gained control of most of Ireland, the O’Neills in Ulster, the O’Briens in Munster (the family of Brian Boru), the O’Connors in Connaught and the McMurrough clan, led by Dermot McMurrough, who held Leinster. When Rory O’Connor succeeded to leadership of Connacht he increasing began to extend his power into Munster, seizing territory from the O’Briens. However McMurrough, who had the support of the O’Neills, remained dominant for some time, importantly retaining at least nominal control of Dublin, then as now by far the most important trading centre in Ireland. In 1166 that changed suddenly with the assassination of the ruler of the O’Neills and a resultant power struggle in the North which left him without vital support. O’Connor wasted no time, quickly taking first Dublin and then most of the rest of Leinster. McMurrough was defeated and left Ireland in 1167, leaving his arch rival as the generally recognised High King of Ireland. For a short time there was relative peace in Ireland, but in England McMurrough was plotting his return. He sought the support of the King of England, Henry II, and of other powerful English allies, with promises of land and influence in return for their help. He succeeded admirably and his main supporter was the powerful Richard de Clare, Earl of Pembroke, also known as Strongbow. 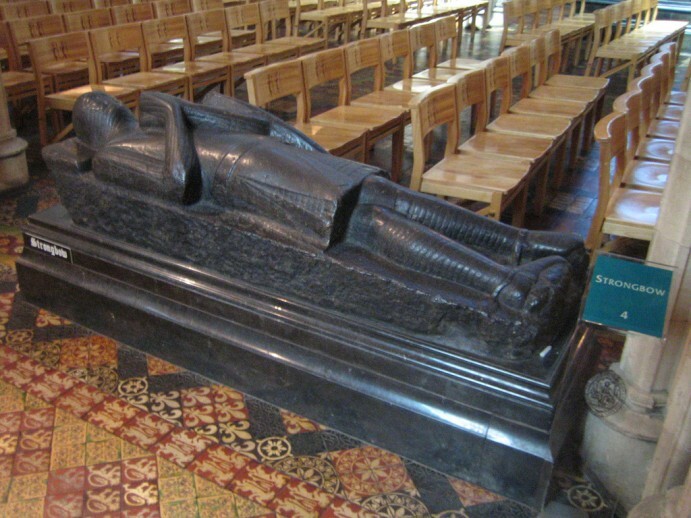 In 1170 Strongbow arrived in Ireland with a skilled, well armed and professional army. With the addition of McMurrough’s still loyal supporters in Ireland made short work of reinstating McMurrough as King of Leinster. The alliance was sealed when Strongbow married McMurrough’s daughter, Aoife, and was promised that he would succeed to the throne, which he did in May 1171. The painting above is a (fanciful) depiction of their wedding, painted by Danial Maclise in 1874. None of this was exactly music to the ears of King Henry, who saw the rapid rise and increasing power of his once loyal subject Stongbow as both a threat and an affront to his authority. In August 1171 he arrived in a fleet of 400 ships with a huge well equipped army, the first time an English monarch had set foot on Irish soil. Ever the pragmatist, Strongbow met the king on the way to Dublin and pledged renewed allegiance, enabling him to reach agreement with the king and retain his lands. In the light of subsequent events, the reaction of the remaining Irish Kings, including Rory O’Connell whose status as High King of Ireland was by now nominal only, was ironic. They welcomed Henry, seeing him as an ally in curtailing Strongbow’s power, and were quick to come to agreements with him which saw their positions consolidated locally. By 1175 the Treaty of Windsor was in place, which made Henry overload of all territory already occupied by the Normans, mainly in Leinster, with most of the remainder held by the nominal High King of Ireland, Rory O’Connor, with the proviso that he swore loyalty to the crown and paid an annual levy. Strongbow held onto Leinster, albeit as subject of the King. However no sooner was the treaty agreed than it began to fall apart. Henry appointed Norman military commanders to enforce the treaty, awarding them land, and then, basically, left them to it. Before long they were enthusiastically engaged in expanding the lands they’d been given. 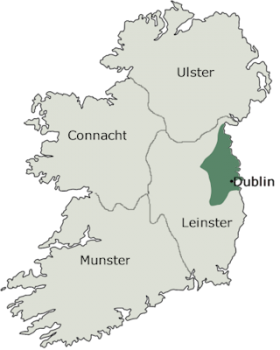 By 1178 they had effectively taken control of significant territory in the kingdoms of Munster and Connacht and under the leadership of John de Courcy were engaged in an attempted conquest of Ulster, in the North. This encroachment continued in ensuing years. By the middle of the 13th century the Normans controlled most of Ireland and the once great clans had seen their influence wane and their territories broken up and considerably decreased in size. While the Normans never succeeded in gaining as large a foothold in Ulster as in the rest of Ireland, though they did control the important East coast, ongoing fighting there saw the O’Neill clan lose their dominant position, with the non-Norman parts of the province broken up between as many as 12 other families. Prior to the arrival of the Normans Irish land was generally held as commonage. While the chieftains controlled territory and expected those living there to contribute food and fighting men there was no real land ownership as we know it today. This all changed pretty rapidly. Not only did the Normans bring the concept of land ownership with them, they brought the belief that they now owned it. Soon large numbers of Irish farmers were reduced to the status of tenants, paying rent and tithes to their Norman rulers in return for being permitted to continue to farm land they had occupied for centuries. This was a situation that would persist, even as the identity of the actual landlords changed, over hundreds of subsequent years, with sometimes horrifying consequences. The Normans were skilled artisans who began almost immediately to establish themselves by building large and imposing castles, to defend the land they amassed. Many of the famous castles of Ireland were built around this time and as commercial centres began to build up around them, some of Ireland’s largest towns were founded or developed beyond small settlements, from Kilkenny and Cahir in the south to Carrickfergus in the North. Almost inevitably intermarriage with the Irish followed, which of course had the advantage of allowing them to marry into land and cement relationships with Irish landowners. The Irish benefited too, retaining land in their family and spreading the native language and traditional customs to their Norman allies. Integration with the Irish developed to such an extent that a new ruling class emerged with dual Irish and Norman heritage, who were often referred to as being “more Irish than the Irish themselves“. Back in England the gradual adoption by the Normans of Irish dress, laws and language caused horror. Between 1295 and 1365 a series of 12 parliaments sat in Kilkenny and they were much occupied with stopping or even reversing this assimilation. The final act of this parliament was to pass into law the “Statutes of Kilkenny“, a series of measures to curb further integration. 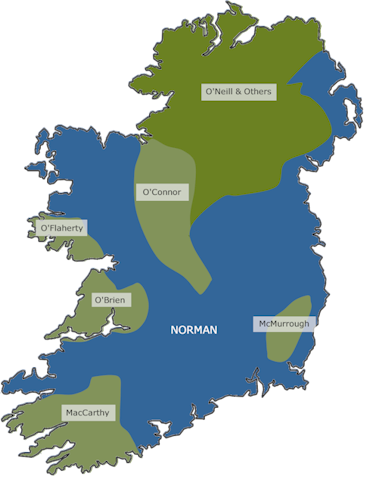 The Norman Irish were forbidden to obey or recognise Irish law, to use the Irish language, to intermarry with the Irish or to give their children Irish names. The measures however were a complete failure, and although nominally still under English rule in reality large areas of Ireland operated independently of the crown. By the end of the fifteenth century only the area around Dublin remained effectively under English control. This area became known as “The Pale”, from the Latin ‘palus’ meaning fence or boundary, and indeed an attempt was made to literally fence off this part of Ireland from the rest of the country. Within the Pale English Law and manners prevailed, beyond it the Norman Irish basically did as they pleased, which led to the modern usage of the term “beyond the pale” to describe unacceptable or uncontrollable behaviour. Eventually of course the English would tolerate this situation no more, and that leads to the story of Ireland’s struggle to maintain its identity over the next 500 years. Ireland is a Democratic Republic, with an elected president. Do you know what happened to Isabella De Clare ? Thank you !